Today I am going to share with you my Gluten Free Marmalade Simnel Cake recipe. For me, it simply wouldn’t be Easter without Simnel Cake – a traditional cake made up of a lightly spiced fruit sponge with a hidden marzipan layer. It is topped with 11 marzipan balls which are said to represent the 11 apostles, minus Judas. My recipe is a slight twist on the traditional Simnel Cake. I have added a little more liquid in order to create a moist sponge, as Gluten Free Flour requires more moisture than normal flour – Simnel cakes are usually slowly baked on a low temperature for a long time, so the extra moisture is necessary to prevent a dry cake. I also used Orange Zest instead of Lemon zest and instead of apricot jam I brushed the cake in a generous layer of marmalade. Simnel Cake would make a beautiful centrepiece for a special Easter Sunday meal, it is also easily prepared in advance and will comfortably feed a large family. 1) Preheat the oven to 140 Degrees C/Gas Mark 1 and grease and line a loose-bottomed cake tin. 2) In a large bowl cream together the butter and sugar with an electric hand mixer or a wooden spoon. 3) In a separate bowl mix together the dry ingredients: sift together the flour, baking powder and spices, then fold through the fruit and the orange zest. 4) Add the eggs one at a time to the wet ingredients along with a tablespoon of dry ingredients to stop the mixture from splitting. Ensure each egg is fully combined before adding the next one. 5) Fold in all the remaining dry ingredients, then add the marmalade and orange juice and mix until fully combined. 6) Spoon half the mixture into the prepared cake tin and smooth out with a spatula. 8) Spoon the remaining mixture on top of the marzipan and smooth out with spatula. 9) Bake in a preheated oven for 1 hour 40 – 50 minutes, until the cake is deep golden brown and firm to touch. 10) Leave the cake to cool in the tin slightly before turning it out onto a cooling rack to cool completely. 11) Once cake is cool, brush the top with a generous amount of marmalade which which will help the cake to stay moist. 12) Roll out 400g of Marzipan into a circle large enough to cover the top of the cake. 13) Place the marzipan on top of the cake and divide the remaining marzipan into 11 equal pieces. Roll the pieces into 11 balls and arrange them around the edge of the cake in a circle. 14) Place the cake under a grill high heat for a minute or so until the marzipan is golden brown – watch it like a hawk or the marzipan could burn! 15) Place the cake onto a serving plate and wrap it in a pretty ribbon. You are now ready to proudly display your beautiful and entirely gluten free Easter centre piece for all the family to admire! Today I’m going to share with you my Gluten Free & Dairy Free Jammy Dodger Recipe – this recipe is also free from eggs and so is suitable for vegans. 1. What type of flour(s) you use. 2. How you bind your ingredients. I’ve found that good gluten free biscuits require a mix of different flours. I usually start with gluten free self raising flour as my base, then add other types of flour depending what kind of texture I want the finished bake to have. For biscuits, I wouldn’t recommend using self raising flour alone, as the biscuits will rise too much and be more cake like. Gluten free self raising flour is a useful base though, as it usually has added raising and binding agents, like Xanthan gum which helps to bind the ingredients together. To the self raising flour I like to add cornflour, which also helps bind the ingredients together, and ground almonds to add some bulk – although I don’t like to add too much, as this could cause the biscuits to crumble. In most of my cookie recipes I usually add an egg yolk to help bind the ingredients together – without an egg, I usually find that the dough is too crumbly and too difficult to handle. This time I decided to experiment with golden syrup, which in my opinion did the job just as well as an egg yolk – great news for vegans! 1. In a large bowl, stir together the gluten free self raising flour, cornflour, ground almonds and sugar. 2. Rub the dairy free spread into the flour mixture until it starts to form a bread crumb like texture. Add the vanilla extract and golden syrup then start to bring the mixture together with your hands until it forms a dough – don’t worry if the dough seems quite soft at this point. 3. Wrap the dough in cling film then leave it to chill in a refrigerator for at least 30 minutes. 4. Whilst the dough chills, preheat the oven to 170 degrees C/gas mark 3 and line two large baking trays with baking parchment. 5. Roll out the dough onto a floured surface. Using a 6cm crimped scone or pastry cutter, stamp out 36 cookies – transfer the cookies to the baking trays using a palate knife or splatula. 6. Once the cookies are on the tray, cut holes in the centre of half the biscuits using small cookie cutters in any shape you fancy – I used a tiny flower cutters and a piping nozzle to cut out circles. 7. Bake the cookies for approximately 10 to 12 minutes or until golden brown – don’t worry if the cookies are a little soft, they will firm up when they cool down. 8. Leave the cookies to cool and firm up on the baking tray for a few minutes, then transfer them to a wire rack to finish cooling. 9. In a small bowl mix together strawberry jam (or the jam of you choice) with some cold water to make it more spreadable. 10. Lightly dust the cookies with the hole in the centre with icing sugar. 11. Spread the jam over the base of the cookies without the holes, then sandwich them together the remaining cookies, so that the jam peeks through! It’s almost Christmas Day! 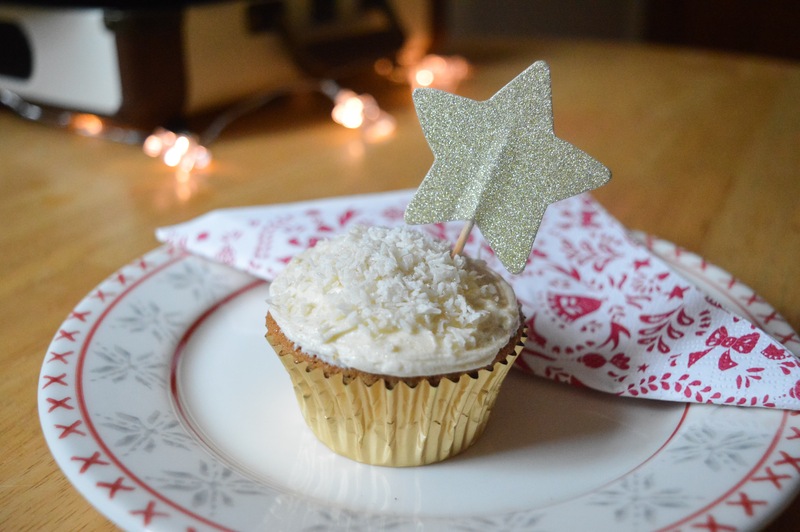 It’s been a busy festive season for me, but I still have one Christmas recipe to share with you this year – my Gluten Free Coconut Snow Cupcakes. These cupcakes are a little different to your traditional Christmas bakes, perfect for anyone who isn’t a big fan of dried fruit but still festive enough to be served on Christmas Day – I think they would also be lovely served at a New Years Eve party! 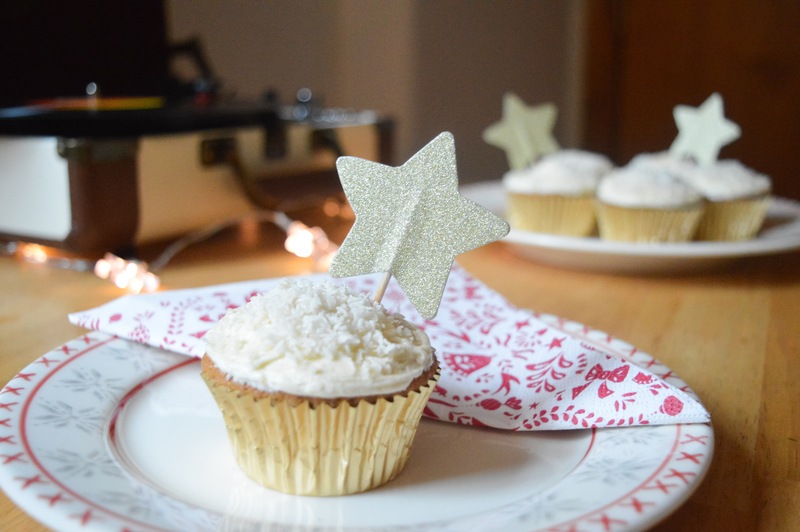 I got these cute star decorations from HEMA – they are actually cocktail sticks but I thought they would make cute cupcake toppers, but you can use any cupcake toppers or edible decorations of your choosing! 1) Preheat the oven to 160 degrees C/Gas Mark 3 and line a cupcake tray with cupcake cases. 2) In a large bowl, stir together the flour, baking powder and bicarbonate of soda. 3) In a separate bowl cream the butter, vanilla extract and sugar together with an electric hand mixer until light and fluffy. 4) Scrape down the sides of the bowl with a spatula. With the mixer on a low speed, add the egg a bit at a time along with a tablespoon of the flour mixture. 5) Once the egg is fully combined, add the rest of the flour and the milk until you are left with a smooth mixture. 6) Spoon approximately one and a half tablespoons of the mixture into each cupcake case, being careful not to overfill them. 7) Bake for approximately 20 – 22 minutes – the cupcakes are ready when they are golden brown and firm to touch. 8) Leave the cupcakes to cool in the tin for a few minutes, then transfer them to a wire rack to finish cooling while you prepare the buttercream icing. 9) To make the buttercream, beat the butter, icing sugar and vanilla extract with an electric hand mixer until light and fluffy and almost white in colour. 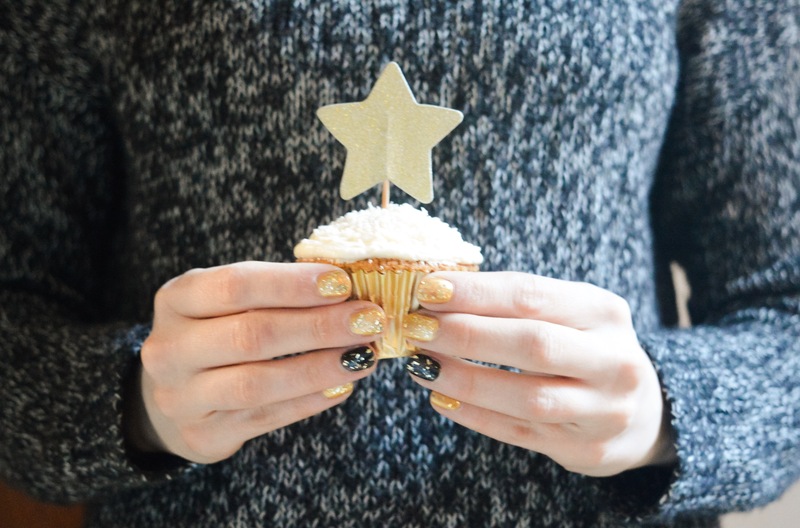 10) Once the cupcakes have cooled, spread the buttercream forest in over each cupcake using a palate knife, then sprinkle each one with desiccated coconut and a touch of edible glitter to finish. That’s it for my Christmas recipes this year! If you’re looking for more gluten free Christmas baking inspiration why not check out my Gluten Free Stollen Muffins, Gluten Free Gingerbread Wreath or you can find a full list of my Christmas recipes over on my Recipes page. Today I’m going to share with you my recipe for this gingerbread wreath which is definitely an excuse to get out the edible glitter. The Gingerbread wreath is completely edible (except for the Red Ribbon) and although it looks impressive and difficult to achieve, it was actually incredibly easy! You don’t need any fancy equipment, just a large dinner plate, a sharp knife and a few different sized cookie cutters. Whipping up the gingerbread dough takes only a matter of minutes and the construction of the wreath isn’t too daunting, as long as you follow the instructions step by step. The wreath is not really design to be used as a decoration as the ribbon won’t support the weight of a wreath – but it would make a lovely edible Christmas gift. 1) In a large bowl, sift together the flours, bicarbonate of soda, ginger and cinnamon. Using your hands, rub the butter into the dry ingredients until it becomes like fine bread crumbs and then stir through the dark brown sugar. 2) In a separate bowl whisk the egg with a fork, then add this to the cookie mixture along with the golden syrup and black treacle. Mix until the ingredients come together. The cookie dough will appear quite wet at this stage but don’t be tempted to add more flour or you will dry out the dough! 3) Gently knead the dough on a floured surface with floured hands until it turns into a smooth, soft and slightly sticky ball of dough. Dust the dough with flour as you knead to stop it sticking to the work surface. Wrap the dough in cling film and leave to chill in the fridge for at least 2 hours – chilling helps the dough to firm up so it can be rolled out. 4) Preheat the oven to 180 degrees C/160 fan/gas mark 4. Roll half of the dough out in between two sheets of greaseproof paper until it is the thickness of a 1 pound coin. Remove the top layer of greaseproof paper, then place a large dinner plate face down into the centre of the dough and use a sharp knife to cut out a large circular disc of gingerbread. 5) Transfer the gingerbread onto a baking tray (you can use the bottom sheet of baking paper to line your tray) then use a 9 cm circular cutter to cut out a circle of dough from the centre of the gingerbread disc and a 1 cm piping nozzle to cut out a hole for the ribbon. 6) Bake the base of your wreath for 10 to 12 minutes – watch out for the edges catching. Once baked, leave the wreath to firm up on the baking tray for a few minutes before transferring it to wire rack to finish cooling. 7) Roll out the remaining dough and cut out 5 large stars, 4 medium stars, 11 small stars and 2 angel shapes. Arrange the shapes onto a baking tray and bake for 10 to 12 minutes – the smaller cookies will need checking after 8 minutes. 8) Once baked, leave the cookies to firm up on the baking tray for a few minutes bering transferring them to wire rack to finish cooling. 9) While the cookies cool, make the royal icing: place 1 egg white in a bowl and slowly sift icing sugar in batches. In between each batch of sugar, stir the icing with a wooden spoon or a balloon whisk until the icing thickens up, then transfer the icing into a piping bag fitted with a small writing nozzle. 10) Next, make the fondant icing: break the ready to roll icing into pieces and place them in a bowl. Add a splash of water and use a spatula to break up the icing until it starts to become more paste like, then add the rest of the water and beat with an electric hand mixer until the fondant becomes runny. 11) Spread the fondant icing over the 5 large star shapes and sprinkle each one with edible glitter. Decorate the remaining pieces with the royal icing and leave all the pieces to dry for about an hour before you assemble the wreath. 12) Use the remaining royal icing to stick the biscuits to the wreath. Sprinkle the wreath with edible glitter and thread a red ribbon through the hole to finish. There will be plenty of festive bakes coming your way really soon. Meanwhile, why not come and see what else I’m getting up to over the festive season by following me on Instagram or Facebook. Remember, If you give this recipe take a snap of it and share it with me on Instagram, Facebook or Twitter using the hashtag #titchytonbakes and I will share my favourites on my Facebook page! It’s beginning to look a lot like Christmas… and I don’t know about you, but I’m rather glad. It’s been a scary and rather uncertain year with everything that has been going on in the world, so I’m grateful for a distraction and I hope that a bit of Christmas cheer will help to take my mind off it… and yours too! So, get ready for my first Christmas recipe of the year and prepare to feel fabulously festive. My Gluten Free and Dairy Free Stollen Muffins are every bit as tasty as actual Stollen and are the perfect way to get your Stollen fix, without the hassle of making bread. Stollen is a German Christmas bread which usually contains dried fruit, almonds, marzipan and spices, such as cinnamon. These muffins are chock full of everything you’d find in traditional stollen, but with a dash of my favourite tipple for good measure, because it’s Christmas! 1) Leave the mixed fruit to soak in Cointreau overnight. 2) Preheat the oven to 180 degrees C/gas mark 4 and line a muffin tin with muffin cases. 3) In a large bowl, stir together the flour, baking powder, bicarbonate of soda, orange zest, cinnamon and ginger, then stir through marzipan. 4) In a separate bowl, whisk together eggs, sugar, oil, almond milk, vanilla extract and almond extract until combined, then add this to the dry ingredients. 5) Gently mix together all the ingredients using a wooden spoon until you are left with a batter which is only just combined (don’t worry too much if there are any lumps), then stir through the dried fruit and the flaked almonds. 6) Spoon approximately 2 tablespoons of batter into each muffin case, then bake for 25 minutes, until golden brown. 7) Leave the muffins to cool completely on a wire rack, before dusting them with icing sugar to finish. Be sure to store the muffins in an air tight container and they will last for 4 to 5 days. These Sweet and Salted Peanut Butter Popcorn Squares are the perfect treat to enjoy on a Sunday afternoon, snuggled up on the sofa in your pyjamas while you watch a film Marathon. Be careful though, they are super moorish! 1) Grease and line a square cake tin with baking paper. 2) Place a large heavy bottomed pan over a low to medium heat, then add the butter and marshmallows and heat them until they have completely melted. 3) Fold the peanut butter through the marshmallow mixture, then add the popcorn and stir until fully coated. 4) Working quickly, spoon the mixture into the prepared tin and smooth it out using a greased palate knife until it starts to reach corners of the tin. 5) Place a large square of grease proof paper over the top of the mixture, then use your hands to press the mixture right down into the tin. 6) Peel off the greaseproof paper and leave the mixture to set for a few hours. 7) Once the mixture has set, turn it out of the tin and cut it into bite size squares. 8) Next, melt the chocolate in heat proof bowl over a pan of simmering water. Transfer the chocolate into a piping bag and pipe a zig-zag pattern over each popcorn squares. Store the popcorn squares in an airtight container and they should last for up to a week.